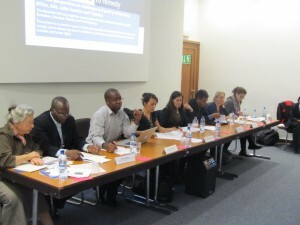 Business and Human Rights: how to ensure that human dignity is at the center of the decision making process? 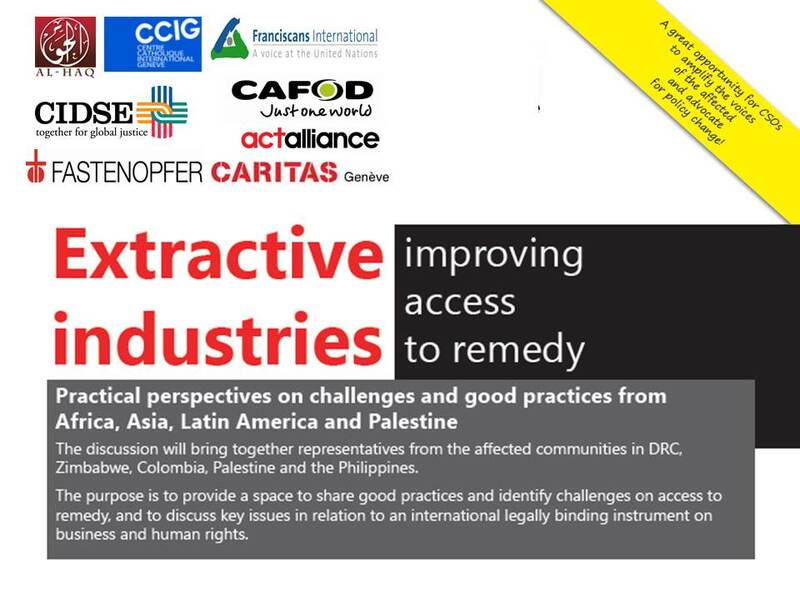 In the framework of the 3rd UN Annual Forum on Business and Human Rights, a conference titled “Improving Access To Remedy In Extractive Industries”, was organized on December 2 by CCIG together with ACT Alliance, Al-Haq, CAFOD, Caritas Genève, CIDSE, Fastenopfer and Franciscans International. 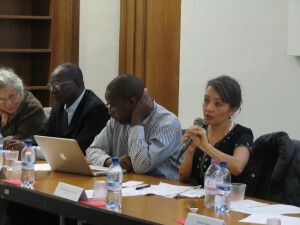 The event, moderated by Ms. Ana Maria Suarez Franco (FIAN International), brought together representatives from the affected communities of Democratic Republic of Congo (DRC), Zimbabwe, Colombia, Palestine and the Philippines, who shared their critical perspectives on the challenges and good practices for the implementation of the Guiding Principles on Business and Human rights and explored ways to improve access to remedy. The panelists emphasized how the implementation of this framework has been very slow until now, as the States have paid limited attention to concrete actions to protect human rights, especially with regard to work, access to land, livelihood, health, and environmental issues. First to take the floor, Mr. Henri Muhiya, the Secretary General of the DRC Episcopal Commission for Natural Resources (CERN), denounced concrete cases, such as the delocalization of Durba’s population by the multinational corporation KIBALI Gold Mines and the violent police responses to peaceful protests. Secondly, he presented the harmful practice from mining companies, such as the Compagnie Minière du Sud Katanga (CMSK), which has sternly polluted the Kafubu river in South Katanga. NGOs providing assistance to affected communities claim that compensation given by the verdict underestimated the cost of damage. Mr Muhiya concluded by urging assistance to the local population in order to prevent and punish human rights violations by multinational corporations as well as NGO advocacy actions in favor of a legally binding international instrument on the topic. The second panelist, Mr. Mutuso Dhiwayo, Director of Zimbabwe Environmental Law Association (ZELA), ACT Alliance partner, illustrated a litigation case that he undertook on behalf of Chiadzwa Community Development Trust. The community claimed to have been reallocated without any discussion or implementation of compensation measures. In fact, the communities were being removed from the Marange Diamond Fields to ARDA Transau to pave the way for proper diamond mining. Mr. Dhiwayo denounced the loss of grazing and agricultural land. 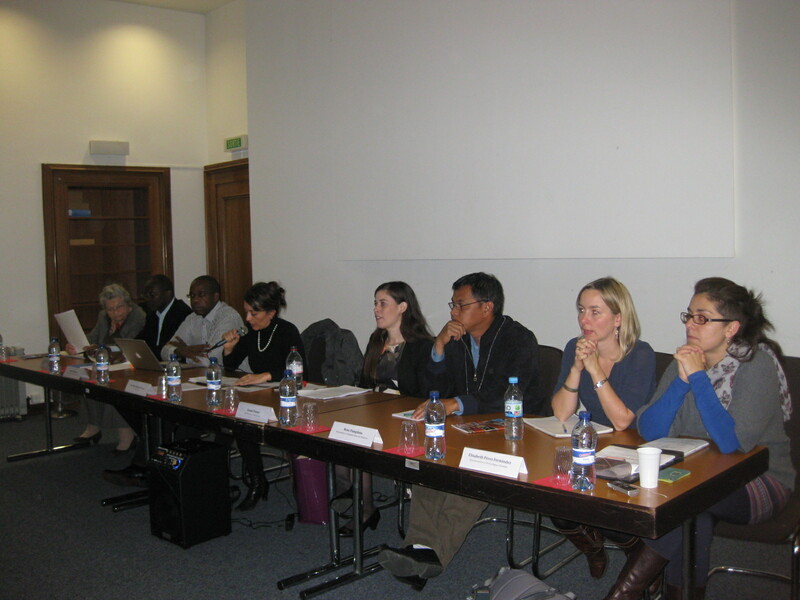 The next panelist was Ms. Elisabeth Perez Fernandez, Representative of Tierra Digna (Colombia). Tierra Digna works with the community of El Boquerón providing legal assistance and advice on resettlement. Local mining activities have a negative impact on the environment, causing contamination of the rivers, damages to public health and social disintegration. Due to related health risks for inhabitants, a Ministerial Decree provides for the reallocation of certain communities, including El Boquerón. However, Ms. Perez explained that such Decree does not provide an access to remedy, since companies do not recognize the negative impact of coal mining on the health of the population nor accept the role of local authorities in the negotiation. Furthermore, local communities fear retaliation, due to the involvement of mining companies with armed groups. Tierra Digna advocates for an institutional reform to strengthen corporate responsibility for human rights violations and, accordingly, supports the international process towards a legally binding instrument. The last speaker, Mr. Pamplona, Advocacy Officer, Social Action Center of the Diocese of Marbel, reported a series of human rights violations and extra judicial killings occurred in the Philippines. An INEF report, commissioned by The Swiss Catholic Lenten Fund and Misereor, shows that the concerned company and the Government have used coercive measures towards the Bla’ans tribe elders and leaders to get their consensus. Despite the extremely serious events occurring in the Philippines, Mr. Rene Pamplona believes that the United Nations Guiding Principles on Business and Human Rights open a window of opportunity for the conduct of Human Rights Impact Assessment (HRIA) for the Tampakan Copper and Gold Project, but a legally binding instrument could do more: “the government has the obligation to protect, the company has to respect and, the victims have a right to access to remedy. But, in the case of Tampakan, as in many other cases that are environmentally and human rights critical, how can this be ensured? A guiding principle is just a mere principle and stays an option to be followed; it cannot stop several situations. What if the mining project is based on a contract between the Philippine government and the mining company? What if the mining company like Glencore-Xstrata is more powerful and wealthier than the government? What if Glencore-Xstrata corrupts government official and employees? Who will stand to protect and who will push for the respect? Who will acknowledge access to remedy?” -alleged emphatically Mr Pamplona. These concerns expressed reflected main challenges faced by communities worldwide. The implementation of the Guiding Principles is currently insufficient and compensation is a disproportionate measure against damage to local population and to the environment. However, all the panelists reaffirmed the need to continue joint work, including advocacy actions, to ensure that human dignity is at the center of national and international process for the regulation of business conduct. No Comments to "Business and Human Rights: how to ensure that human dignity is at the center of the decision making process?"